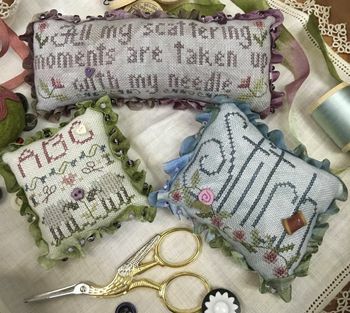 "All My Scattering Moments" is stitched on 32ct Shale linen by Picture This Plus; stitch count is 29 x 80. "Stitch" is stitched on 32ct Sterling linen by Picture This Plus; stitch count is 35 x 46. "ABC" is stitched on 32ct Limestone linen by Zweigart; stitch count is 29 x 33. Button Pack is available from House of Stitches.